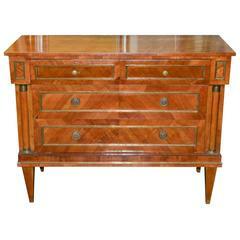 A walnut and satinwood marquetry cabinet of small proportions. 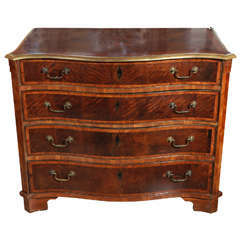 The banded serpentine top and with a single drawer above a cupboard door (opening to the left) is made in the form of two dummy drawers, all with decorative satinwood marquetry and furnished with two brass drop handles. The whole raised on four cabriole legs that unite with a serpentine apron and end on scroll feet. Four drawer, cross-banded commode with clipped corner, brass railing. 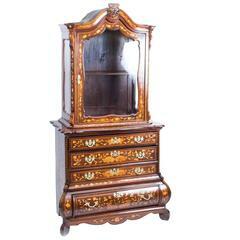 Marquetry parrot on top and marquetry floral designs on the sides. 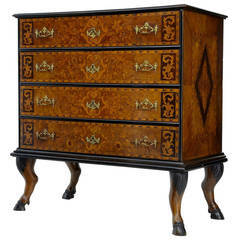 Excellent Continental walnut four-drawer commode with brass hardware and trim. 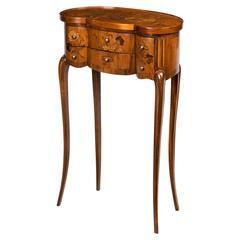 Having a beautiful rich warm patina, columnar supports, and resting on tapered legs.